This vintage early '60s Evan Picone wool jacket has a black and white pattern. It has a 7/8" wide black trim around the neckline, down the front, and around the hemline. It has a really nice black lining. 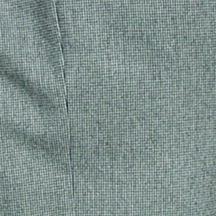 The front has an inner closure 6" from the bottom hem. It consists of 2 inner loops, 2 black buttons, and 3/4" of black cord between them. The long sleeves have 3 fabric trim matching buttons. It was used as wardrobe in a movie over a black wool skirt, black nylons, and black and white Bruno Magli pumps. shoulder pad to shoulder pad 15"
shoulder pad to end of sleeve 21 1/4"
shoulder to hem 20 1/4"